You’re packing for that important vacation. 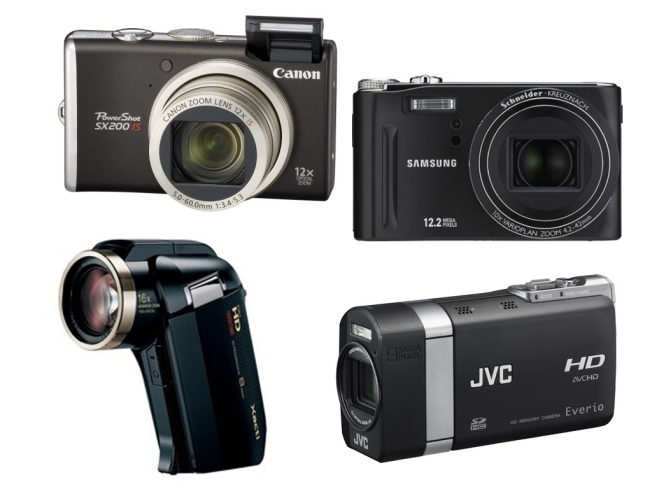 You grab your point-and-shoot camera because its small and travels well. Trouble is, it takes bad movies. Since it’s an important trip you toss in the high definition video camera to be safe. But wait, there’s also the accessories-- throw in both chargers, camera cards, video tapes, and cables. Instead of packing light, you suddenly feel like a production crew filming a documentary. A new class of hybrid “Powerzoom” cameras arriving in stores this month promises to fix this dilemma. If you're in the market, now may be a good time to buy. These mini devices offer the holy grail of imaging: a pocket sized camera with sharp HD video, incredible megapixel resolution for great photos, and dynamic wide angle/zoom lenses capable of capturing even the most demanding moments. Advances in CCD technology have increased the resolution of cameras as high as 12 megapixels (more in professional models). This kind of detail lets consumers print razor sharp images as large as 11x14 with profession quality. At the same time, improvements in compression technology and processing power have made it possible to squeeze full motion HD video into small files that fit on SD memory cards. And the quality is impressive-- the resolution of today’s pocket cameras often exceed professional broadcast cameras from just a few years ago. Improvements in optics have also created better lenses. Many new cameras feature 28mm wide angle lenses combined with a 12x zoom. Consumers get the best of both worlds: wide sweeping landscape panoramas as well as close-up shots of friends even when you're standing far away. Models are appearing on store shelves from most of the major manufactures including Sony, Canon, Panasonic, Samsung, and JVC. We’ve compiled a list of top must-check-out models. Click over to the slide show for specs and more information.